Exray’s, Exray’s! Read all about it! 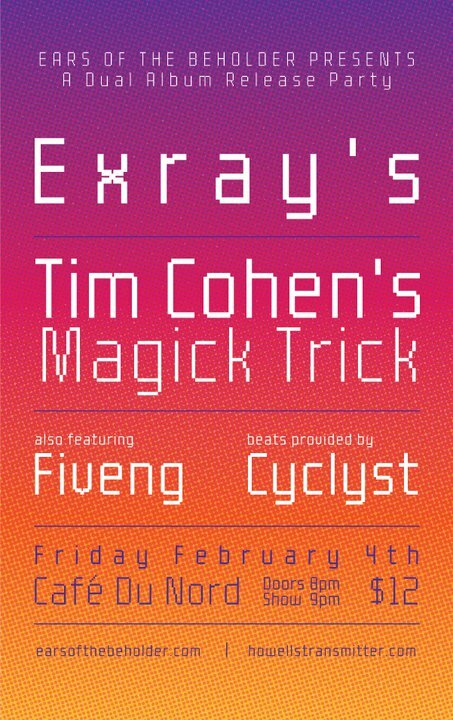 We’ve got an awesome album release show for you!Â Exray’s LP and Tim Cohen‘s Magick Trick @ Cafe Du Nord on February 2nd, as in this freakin’ Friday!Â Fiveng and Cyclyst will also be performing. Want a pair of FREE tickets? Just post a comment below sharing the coolest magic trick you’ve ever seen or hell, how about one you’d like to see.